It's Hallowe'en but an exorcism won't be necessary. As the last in the maternal line I've inherited the family portraits going back almost three hundred years & there's long-dead ancestors giving me disdainful looks from the walls in every room in the house. Nice but hideously dim, bet he wouldn't have been capable of tying his own shoelaces. This bloke was a member of the clergy, he'd probably spontaneously combust at our godless lifestyle. 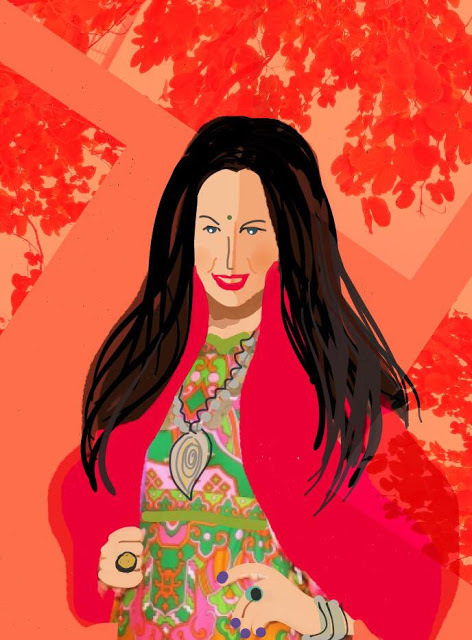 Bet she wouldn't have enjoyed backpacking around India or getting down & dirty at Glastonbury. This one looks like a right old cow. Bet she's horrified by my unmarried, voluntarily childless state. I even wear dead people's stuff. This is Great-Great Grandma Alice wearing the same brooch 130 years before me. An obsession with massive silver jewellery must be a family trait. There's a fashion for calling it "curating" but I'm not one for poncy labels, I'm just a hoarder, plain and simple. When this box slid off the top of the wardrobe this morning I took it as a spooky sign that it was crying out to be featured on my blog. I used to roller skate round the block wearing this over 40 years ago. What an odd child I must have been. Mind you, there's a red wine stain from when Mum wore it to the pub, such disrespect, Mary must be turning in her grave. How freaky that I'm the identical size and height to my Great-Grandma, a lady I never met. I'd love to know what she'd have thought of her Great-granddaughter's lifestyle. It couldn't have been more different to hers. Have a ghoulishly spooky night if that's your thing. We'll be padlocking the front gates as soon as darkness falls to keep out any feral youths demanding money with menaces (sweets aren't acceptable around here, it's a £5 note or a brick through the window). It's always an event when the postman knocks, we're on first name terms and everything; it's not just because of the regular parcels of joy from my generous blogging buddies but also 'cos I went out with him in the 1980s. Last week my bag twin, the lovely Lucy, sent me this incredible turquoise leather coat she'd spotted in her local Sue Ryder chazza along with this Oscar Wilde notelet, literary idol of Smiths fans like me the world over. I'm wearing the Miss Revolution velvet blouson top Jo gave me underneath it. Orange and turquoise are a perfect pairing as some of this Tibetan tribal jewellery goes to prove. The copper and turquoise pendant is Native American via Canada, a gift from a globe-trotting admirer of Mum's in 1965. 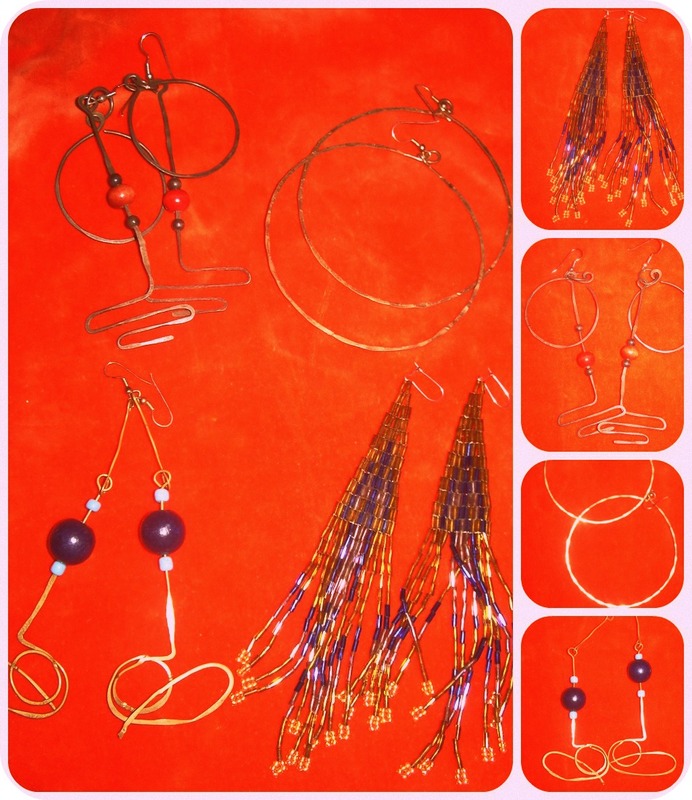 I bought the earrings on the morning of the Asian Tsunami on the way to a wedding in India back in 2004. The wonderful Pao sent me these 1960s earrings she no longer wears, they arrived today and I love them, they're massive. She also sent this groovy bean bag pattern. The cats have hinted that they need one in their lives. So what's a chip butty? Two slices of crusty bread spread with butter or mayo, a generous helping of "proper" chips (chunky French Fries), smothered in tomato ketchup and the finest hangover cure known to man (or woman). Thinking of and sending my love to anyone caught up in Hurricane Sandy. Nothing dramatic to report here although there is a blogger meet-up scheduled for later in the week, Walsall residents of a nervous disposition are advised to leave the area. 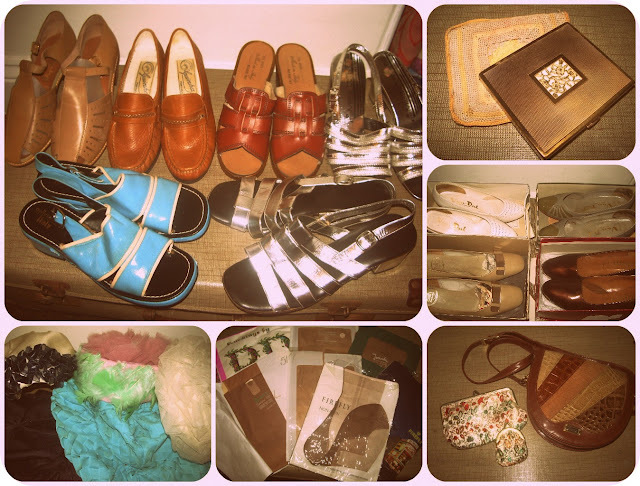 My weekend's mostly been spent keeping warm, meeting vintage-lovin' ladies, rummaging for bargains, getting back into boozing, eating, eating and more eating. Here I am last night all dressed up for dinner and linking to Patti's Visible Monday. Here's fabulous Jo rummaging through the rails in Blogland's now legendary Second To None on Friday. She passed on this 1950s Edwardian-style taffeta frock despite it's £9.80 price tag. 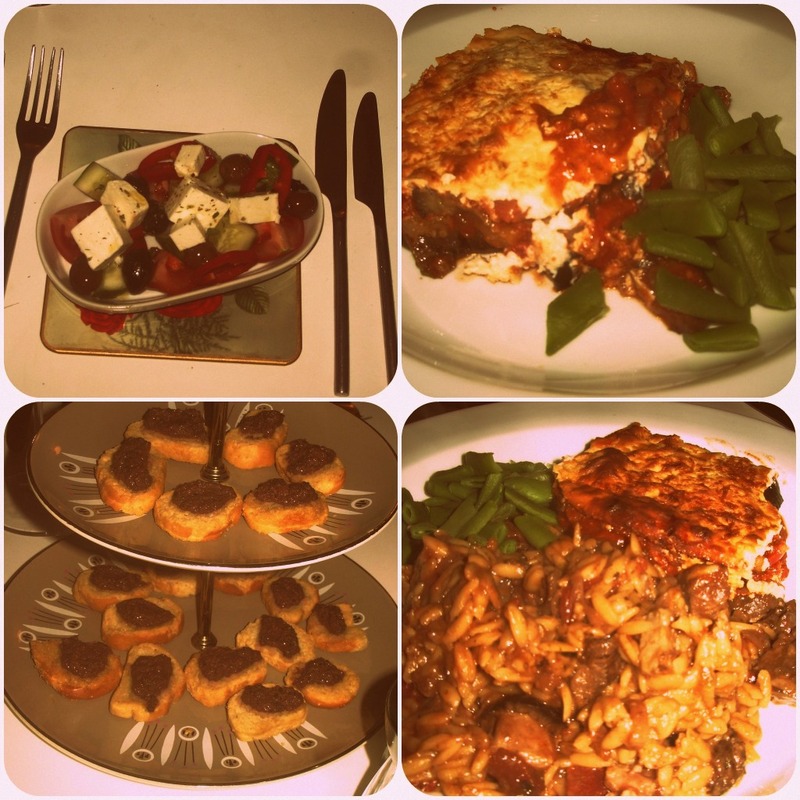 Jo's over in the UK from the States, reacquainting herself with the delights of British second-hand shopping along with outings to cultural events and vegan gatherings. She's as much fun as her gorgeous smile suggests. She gave me the dress I wore last night. The label's just as beautiful as the exterior. She also thought I'd love this groovy velvet blouson top, which I do! Back round ours for a cup of tea and a house tour. Yesterday the lovely Liz came from Bristol to visit. Naturally we stopped off for lunch in Wetherspoons, but passed on the faggots. After a couple of hours trying on the merchandise in Second To None we hit the town's chazzas. Then went back to ours for tea and a Vix house tour. I bought this dress from Second To None on Friday. I tried it on when I was last in the shop HERE and as it was still there I saw it as a sign I was destined to have it. Dinner at Liz and Al's - Greek salad starter, my serving of Veg Moussaka, Tapenade appetiser, Lamb Orzo (for the carnivorous members of the gang). 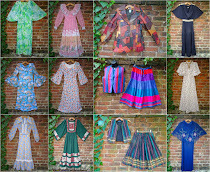 Since I last blogged I've consumed a Halloumi cheese wrap with salad and a sweet chilli dressing, Vegetable Madras with steamed rice, poppadums and a cheese & garlic nan, Wetherspoons' five bean chilli with pilau rice and tortillas, six doorstep slices of toast with Marmite, two bowls of soup, four oranges, three chunks of a vegan chocolate brownie (and I don't even have a sweet tooth), two and a half bottles of Rose, a quarter of a bottle of rum and most of the collage above. 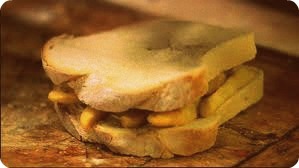 Time for a mega blog catch-up, Inspector Montalbano on the i-Player and the obligatory Sunday night chip butty for tea. Hope you had/are having a brilliant weekend. I haven't got a problem with modern clothes, I buy what I like but it just happens to be that 99.9% of the time it's pre-1974. The contemporary stuff I find second-hand usually bores the pants off me. I couldn't resist snapping up this leather jacket from the jumble sale though, even if I only wear it a handful of times I'm sure to recoup my costs when I sell it on. So, in addition to my jacket and top what else did I buy? 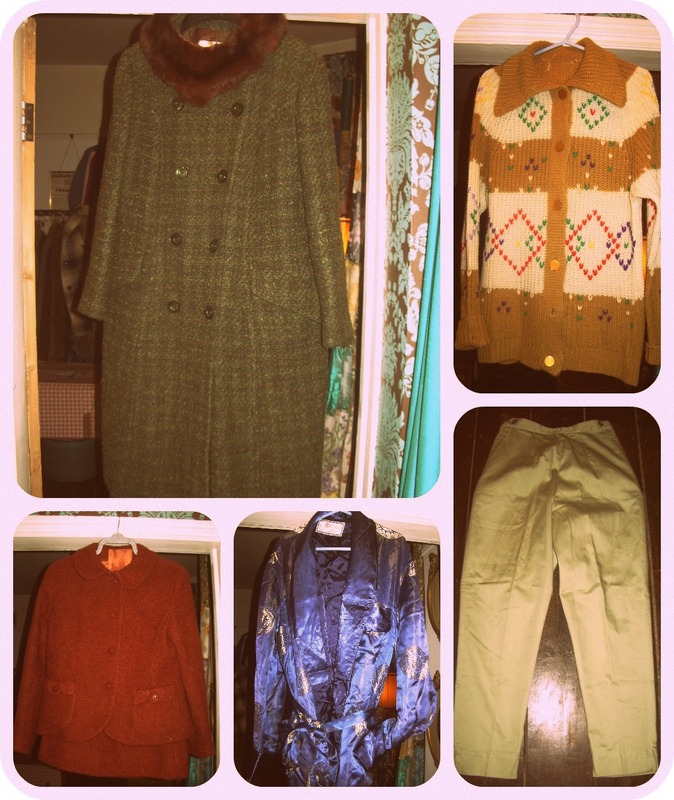 1950s Eastex coat, 1950s handmade cardi, 1960s Modette ski pants made in The British Colony of Hong Kong by Prova, a satin smoking jacket (in urgent need of ironing!) 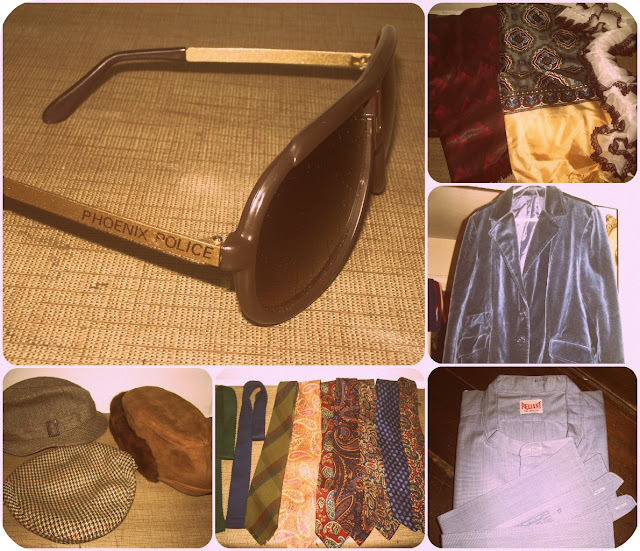 and a 1950s bouclé wool suit by "Riddella, Tailor Made"
Some fab bits for male visitors to my vintage stall - Retro Phoenix Police glasses, satin scarf, pure silk foulard and a jabot, Velvet jacket, 1930s unworn shirt complete with replacement collars, a selection of 1960s English-made ties and some cool hats. 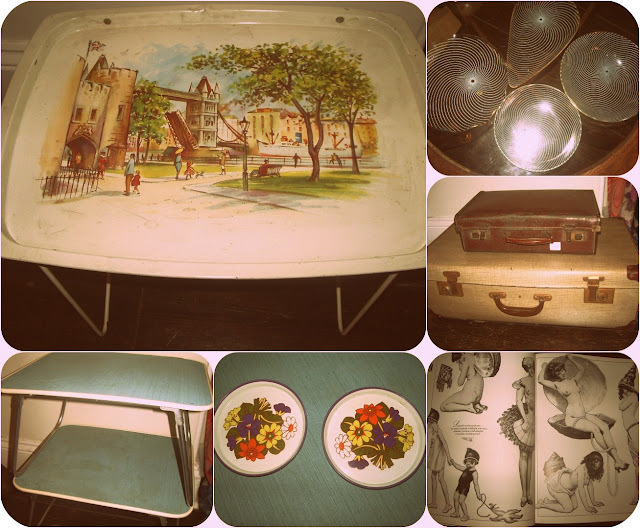 1960s London breakfast tray, set of Mid-century modern party dishes, two suitcases, Ronnie Barker's book of Bathing Belles (did you see Jen's post HERE yesterday? ), pair of 1970s tin coasters, pair of two boxed folding picnic tables. I spotted this quilted waxed jacket and snapped it up, it might be the style beloved of teenagers everywhere but I thought it would do for when Jon's working outside. I didn't notice the label until I got it home. Maybe it's a bit too posh for crawling under vehicles? Not everyone donates dirty knickers and odd shoes, some people are amazingly generous. Don't ask me what or why, Jon can't help himself when it comes to old skool music systems. Must dash, we're meeting the gang in town in less than an hour. I'll try catch up with you between blogger meet-ups. This is what I'm wearing for a day of hard manual labour. This is the second time Jon & I have volunteered at the monthly jumble sale, today we've been setting up the church hall, erecting trestle tables, hulking boxes about and sorting out the merchandise ready for the doors to open at 2pm tomorrow. Whilst it's undeniably exciting to rip open the bags of donations and lay them out on the tables, handling the soiled underwear, bloodstained clothing, filthy bed linen and unwashed crockery isn't for the feint-hearted. (Not that anything tops the dead dog I once found in a donation bag back in the 10 glorious years I worked as a charity shop volunteer). When you come back with a heap of treasure like this it makes the filth worth it. 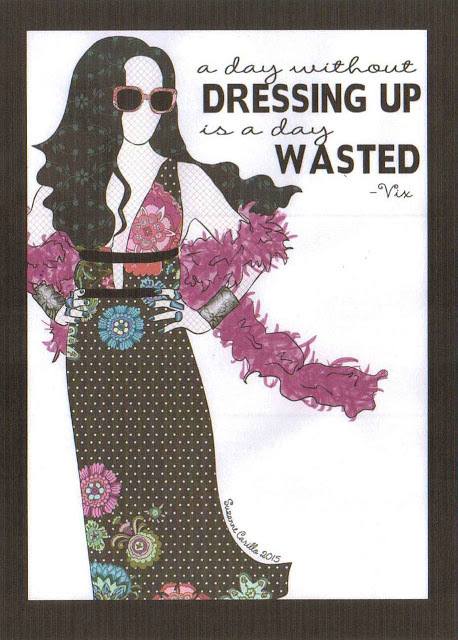 In the meantime feast your eyes on this incredible dressmaking pattern and beautiful hand-made card courtesy of the lovely Elizabeth. Can't wait to have a bash at those pants! 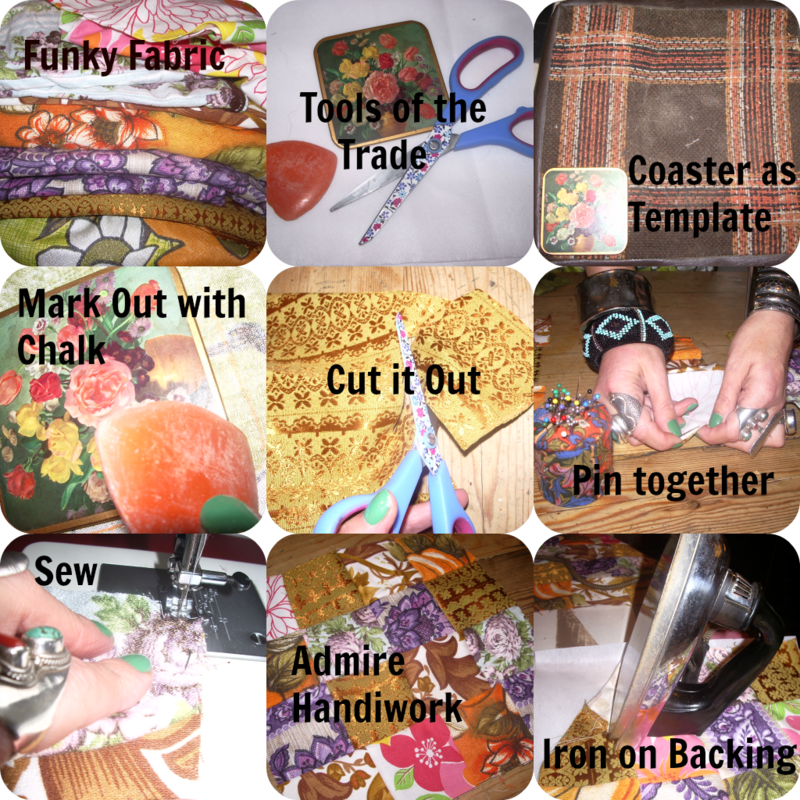 You didn't imagine it, my blog title did mention patchwork. This pair of 1970s vinyl seating cubes came from last month's jumble, I thought they'd perfect for get-togethers but those hideously drab hues are enough to sober up the liveliest of party animals. A quiet afternoon yesterday meant time for a makeover. I hand-sewed the groovy new seat pad on top of the old one and this was the result. The pair of cubes were 50p and the fabric and interfacing were already in my stash so a cheap (and now, cheerful) addition to the house. Fit to grace the bum of my next house guest! Come back tomorrow and I'll show you what we bought. Right now I need a good scrub under a hot shower.